Just a few weeks ago, SAP released SAP BusinessObjects 4.1 as a ramp-up release. Based on the current schedule, it will be GA on September 29th 2013. Some of you will have the privilege of participating in the ramp-up program. It just so happens that we (DecisionFirst) have been participating in the program for the past few weeks. This has given me the opportunity to interact with the new release directly. Now its time to share what I have learned. As opposed to listing all of the “What’s new” features in this posting, I have decided to simply list a few items that I have observed and what you can expect. There are actually quite a few features documents already available that discuss the “What’s New” features of 4.1. I don’t believe I can add anything new that is not already listed in the links below. However, I encourage you to read through these documents. With that said, the following is a limited list of what you can expect to find in 4.1. 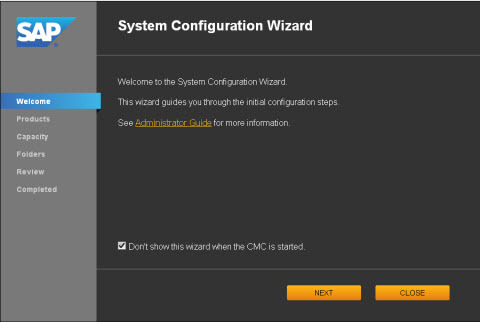 The new System Configuration Wizard (SCW) can be found within the home page of the CMC. This new tool allows you to easily size and split your adaptive processing servers. It also stops services that you won’t use. It asks you a series of questions based on your expected utilization and the amount of RAM on your server. It then re-deploys the servers based on preset templates. It was very easy to use but I have seen a few problems when you upgrade. If you are upgrading from 4.0 to 4.1 and had previously split your APS services manually, I would advise that you delete your existing APS services before running the SCW. The SCW will automatically re-deploy new ones based on your feedback so don’t worry about loosing anything. There were a few changes to the way that SSO is processed in the BILaunchpad.properties and OpenDocument.properties files. There is a new configuration parameter that establishes the SSO processing priority. For those organizations that have multiple SSO methods configured, the “sso.types.and.order= ” parameter will now allow you to list the order in which different SSO methods are processed. In addition, I found that this needs to be set even if you are only using (for example) Vintela. For me, Vintela SSO did not work until it was in the list. If you are installing 4.1, be prepared to visit this parameter post install. The new features found in SAP BusinessObjects 4.0 SP5 and SP6 are found in 4.1. Explorer 4.1 support the UNV (UDT) universe. This should have been available day one of 4.0 but “beggars can’t be choosers”. With that said, this gives you a few more options to consume BW data within an Explorer info space. It also mitigates (Not Eliminates) the need for you to migrating Universe to the IDT (UNX) format. The installation process is faster. In my experience it takes about 30 minutes less per node. You can now install patches and updates in parallel. I’ll admit that I have not tested this but it is listed as a new feature in some documents. If it turns out to be true, this should make the update and patch process go much faster in a clustered environment. Sybase SQL Anywhere is now the bundled default database for the CMS and Audit DB. Crystal Reports 2011 is now Crystal Reports 2013. SAP Visual Intelligence is now SAP Lumaria. 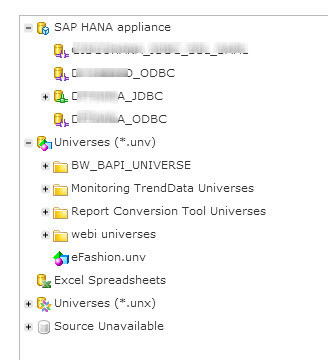 Universe and Webi Query Striping is available for relational sources not just OLAP. Deski is back (again!!) Although you can’t view and schedule Deski reports in the BI Launch Pad or CMC. It is intended to help organizations migrate from Deski to Webi without the need to run two environments. Mobile versions of Dashboards 4.1 can be based on a QaaWS or BIWS connection. This extends mobile support to the legacy web services connectivity options. This is a great add that was sorely missed in 4.0 SP5 and SP6. There are obviously several other enhancements in 4.1. Using the links provided above will be a good starting point to understand all the changes. My last and final thought is around quality. Having all these new features is nice but my one hope is that everything that is intended to work, actually works. I also hope to see fewer error messages when performing routine tasks. Based on my initial testing, 4.1 appears to be a very stable build. However, until I see it in operation at a customer’s site, I will hold off on my full blessing. ← What’s new is SAP BusinessObjects 4.0 SP6? Thanks very much for this blog.. I’d love t get my hands on the 4.1 software and test it. From what I read here and in the links I’ve clicked on so far, I can’t wait to see it! Reblogged this on SAP BI BLOG. “sso.types.and.order= ” –> I think this should be very cool for some clients with some different authentication methods in their environments. 4.0 SP5 and SP6 are found in 4.1. –> That is good! 11.Deski is back (again!!) –> LOL! 🙂 This is their “boomerang” tool! Didn’t they first try to deprecate it in 1998? Thanks for sharing information, Jonathan! Thanks for sharing your experience so far with 4.1. Here is another doc with comparison of all the version from XI to 4.1 Features. Thank Rajan. I actually had that linked above in the main paragraphs. Thanks for the blog! Latest I heared is that SAP is aiming to have 4.1 GA in August already ;-). As usual Jonathan well done and informative. Thanks for the links. Great article. Looking forward to 4.1. You recommend deleting the existing 4.0 APS configuration and let the SCW redeploy the APS. Any significant reasoning behind that? Is there anything new about the APS’s and how they are deployed that prompts that recommendation? I read somewhere that BI 5.0 will have a significant number of new APS’s so it is good to see they have developed the SCW tool to manage the deployment of these services. In a few cases I had to delete the APS services that were upgraded. The upgrade put the existing services in a state that prevented them from starting. In one case the SCW was unable to delete them when it tried to redeploy them. Thank you Jonathon for your blogs..
I’ve just come back from some annual leave, I’ve installed 4.1 as a new installation on a Windows 2008 R2 server, which installs fine… The only issue I have is that I can’t install Data Services 4.1 on the same server as the DS4.1 installation doesn’t deploy the web pages into the CMC properly, so you cannot create the repositories in the CMC… ARGHH!! Anyone else found this yet?! I believe, BOBJ 4.1 is only compatible with Data Services 4.2 which is also in ramp-up. Do we know, till which version of Business Objects of UNV universes will be supported.Is it till SP7? I wanted to know if there is Central Configuration Manager in Business Object 4.1 which manages all the servers such as Apache Tomcat, SIA, Mobile server. If not can i use BI server as the server for BO 4.1? What does ramp up actually mean? Does it contains the BETA version? I have not installed 4.1 SP1 and can’t find it on SMP. If it is in that SP, it should make a big difference. Thank you so much for the parameter that makes SSO working ! I’ve lost a lot of time before getting the solution from your site. I did the parallel update of 4.1 SP1 and noticed that in one of the node at the end it got struck and never finished.. I had to rerun the install and resume back after around 4 hours of it getting struck. I am not confident trying parallel update in Production.. Thanks for the info. I’m sure there could be other causes, but in the past the parallel install was an issue because the install engine on one node, would restart the CMS on another. If a particular node was in the process of updating the CMS, it would cause it to fail or lockup. If you check the install logs on the failed node it should indicate where it was at when it locked-up. If it failed to find a CMS, than SAP has not resolved the parallel install issue after-all. Any news on the stability of the product and in particular concerning Webi and robustness of connections to BW? It is moderately stable. I have not found any Big issues. However, there are a few small situational issues outstanding. Concerning connectivity to BW. Most of the enhancements are around delegated measures and Webi’s new ability to auto-refresh the report when its report calculation context changes. we are currently on 4.0 Sp05, we have a reporting requirement to show users and user group details. Currently , we need to use either Query Builder or SDK to extract CMS metadata. I heard in 4.1 sap is delivering some standard solution to achieve this. any ideas? Outside of the SDK, I have not found anything in 4.1 that can provide this information. It a very simple path statement (Query) that returns the information.